When Chipotle discontinued its chorizo meat option in favor of greater focus on its troubled queso launch last September, fans of the spicy pork and chicken blend hoped it'd only be a matter of time before the burrito chain added it back to the menu. Almost exactly a year later, that time has finally come. Chorizo is officially back. 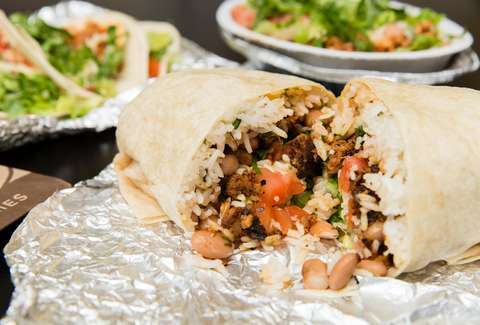 Chipotle announced the menu update on Monday, saying chorizo is now available at all of its locations nationwide. As you may recall from that last time it was available, the chain's chorizo is made with a blend of pork and white-meat chicken that's seasoned with toasted cumin, paprika, and chipotle peppers and seared on the grill to add a bit of char flavor. Like everything else on Chipotle's menu, it doesn't have any artificial colors, flavors, or preservatives. You can order it in burritos, burrito bowls, orders of tacos, and salads. Unfortunately, it doesn't look like chorizo is back on the menu for good. The company said it will be available for a "limited time," but didn't offer any details on when it might be discontinued again. You'll have to eat it while supplies last. As Chipotle's ongoing push to bounce back from major food-borne illness incidents nearly three years ago continues under new leadership at the company, expanding its famously limited menu has emerged as a key way to lure customers back to its restaurants. In fact, execs recently unveiled the future of Chipotle's menu, which includes new options like quesadillas, nachos, avocado tostadas, and more. The chain is also testing offers like happy hours with $2 tacos. All said, maybe you can score some $2 chorizo tacos sometime soon.